We cannot stop automation. It will be forced on us if we don’t embrace it. Our present economic model requires a large consumption component. Past economic models are no longer applicable. : Executive Leader Coach @ dbkAssociates, Inc.
Over the holidays a couple of years ago, I was able to tour the Henry Ford museum. It was fascinating to see all that engineering talent embodied in the decades old machinery on display. I was reminded of this as I browsed through some images on my PC. Last week’s post discussed (once again) the issues around automation and how our employment situation is not going to be solved by the ill-conceived push to bring manufacturing back to the U.S.A. Manufacturing is already returning to the U.S. and it has been for some time now. It’s returning because companies (U.S. and Foreign) can now, employing automation, save the cost of shipping to their global markets AND avoid high labor costs as well. Thus repatriation of manufacturing has not and will not have nearly the impact on employment that our average citizen (and apparently ill-informed politicians) think it will have. 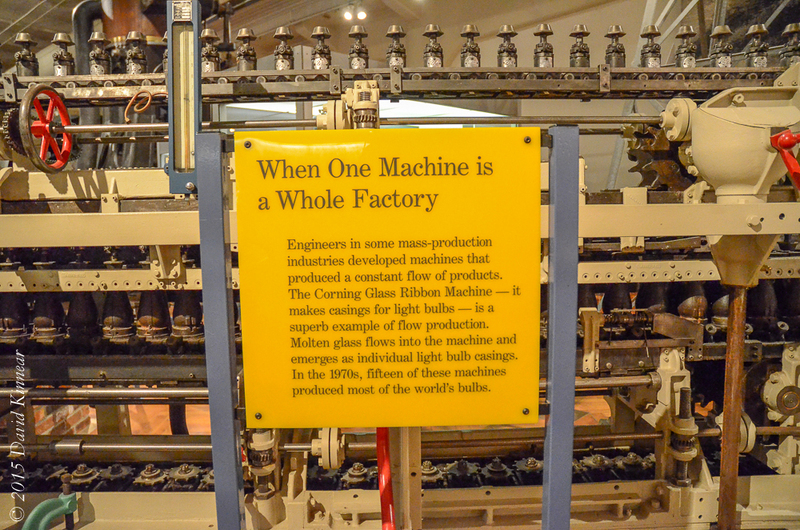 In the first image, above, you will see that the machine behind the sign is a glass blowing machine. 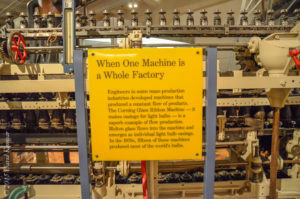 According to the information (click on and enlarge the image to read it), in the 1970’s, fifteen of these Corning Glass Ribbon Machines made the casings for almost all the world’s light bulbs. I saw this at work in a modern factory right here in the U.S. As I mentioned last week, manufacturing is doing very well here in the U.S. It is employment in that sector that is suffering. 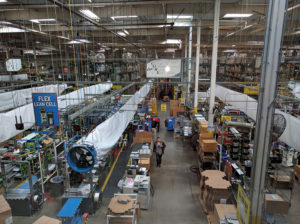 In the second image, we see a modern manufacturing facility with several flexible lean fabrication and assembly cells. What makes them flexible is the movable automated metal working machines (NCR and Computer Controlled). From engineering drawings to finished product. 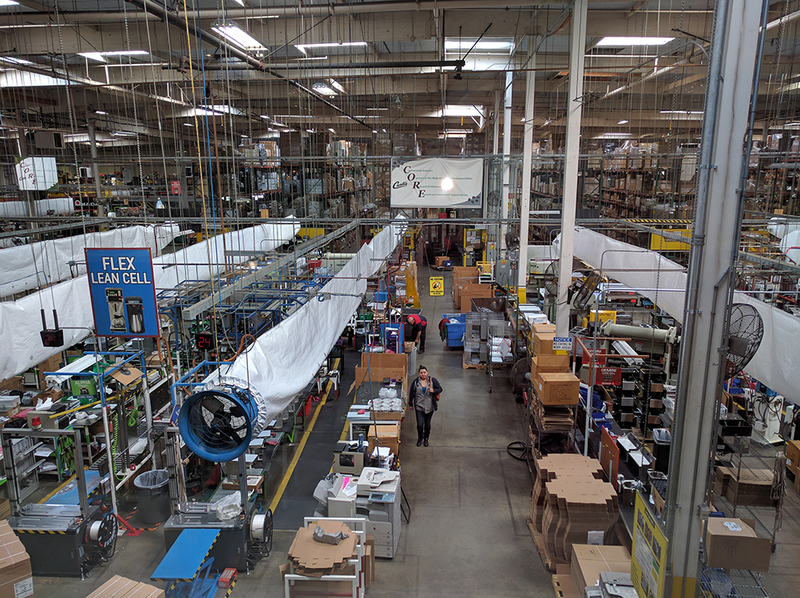 Being able to easily and quickly retool to move from one product to the next means reduced finished goods inventory as well as better quality control. Customers appreciate being able to order product in the quantities they need versus having larger minimum order quantity requirements. Today, the modern factory might not strive to have one machine complete all production of a single product, but it rightfully strives to design factories that are flexible and maximize the predictability of cost effective, high-end automation. Here are some thoughts about the dilemma of employment in manufacturing. We cannot stop automation. It will be forced on us if we don’t embrace it. Our present economic model requires a large consumption component. Past economic models are no longer applicable. Last week, I asked many questions about what you are thinking about this conundrum. My thoughts are as follows. First, trying to resist automation is useless. Second, continuing to expect GDP or other measures of economic growth to grow as in the past is also useless. Third, the stigma of being unemployed in the old sense of the word must and will be eradicated. Next, humans in our country will have to give up defining themselves by their profession/job. Additionally, we will find that globalization is impossible to stop—every nation needs every other nation as a source and market.